Raising livestock is almost never an easy task. From sun up to sun down there is always something that needs to get done or needs to be fixed. When you get in the house after a long day of breeding heifers, sorting pairs, fixing fence or oiling a windmill, you have just enough time to cook supper, and get the kids ready for bed. 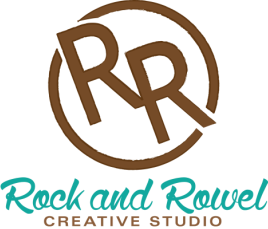 That's why Rock and Rowel Creative Studio is the creative hired hand you've been searching for. I can design decals for your new stock trailer, flyers for your upcoming bull sale, update your old business cards, and more! Hello there! I'm Lacey, and I understand the long days and short evening a farmer and rancher (and the wife) deal with. I'm here to help make things a little bit easier for you. Who is this owner lady you ask about? For the last seven years, my husband and I lived out in the "hills of sand", "God's Cattle Country," the beautiful Cherry County, Nebraska. It's a wonderful place to live and trust me..I still have sand in my boots! But recently, home was calling us back so we packed up and started a new adventure with our cattle, horses, pups! A few things I think you should know about me: I went to college, twice actually, the first time for Graphic Design, and the second time for Agribusiness. And something else I am pretty proud of is that I also have a certificate for Bovine Artificial Insemination! Yup, that girl in the mint dress can successfully A.I. cows. We have two adorable furbabies (an Australian Shepherd and a Blue Heeler), three wonderful cowy horses, and a small herd of Angus cattle, and let's not forget the Hereford bull. I've been a Graphic Designer for almost 10 years now, and also dabble in photography when I have the chance. My tools of the trade include my sketchbook, a pencil, my Macs, a Canon T5i, and a vinyl cutter. I occasionally like to paint and do a little cake decorating as well–because who doesn't like cake?! When it comes to designing, I'm a bit of a perfectionist...ok maybe a little bit OCD. And for that reason, I will spend hours on spacing text until it looks right. I believe the small details are key to a great design! Please browse through my site and check out my work! If you have any questions, feel free to contact me, find me on Facebook or check out more goodies on Instagram. My "team" behind the scenes. My little support system of fun, inspiration, laughs, hugs, and usually cheap entertainment to get me through the day. Did I mention they are pretty good at distracting me from work sometimes? But how can you resist those furry faces!